Coverage: Live text commentary and The Cricket Social programme on the BBC Sport website and app. England captain Joe Root says Jos Buttler is likely to keep wicket in the first Test against Sri Lanka next week if Jonny Bairstow is ruled out. 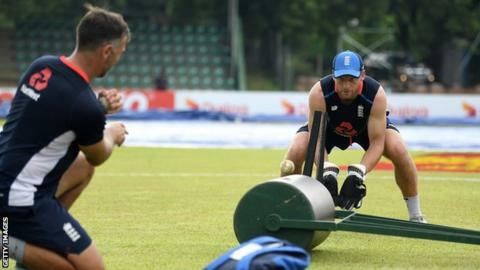 Bairstow is recovering from an ankle injury picked up while playing football, but Root says England have options with Buttler and Ben Foakes. The first of three Tests starts in Galle on Tuesday, 6 November. “Although Jonny will be a big loss, we’ve got great players that can come in and rebalance the team,” said Root. “It’s day-by-day with Jonny at the minute. He’s actually made good strides and recovered a little bit quicker than we anticipated, but it’s still a long way to go. Surrey wicketkeeper Foakes was called up to England’s Test squad as cover for the injured Bairstow. But asked whether Lancashire’s Buttler would be the man to start in Galle, Root told BBC Sport: “That will probably be the likely scenario. “But the reason we called Ben up is because he’s a high-quality keeper and we give ourselves another way of balancing the side out and give ourselves a chance of winning. Root says warm-up games against a Sri Lanka Cricket Board President’s XI will give him a chance to assess the conditions and his team for the first Test. “I’ve got a strong idea of what the core of it looks like, but we have got some great options,” he added.